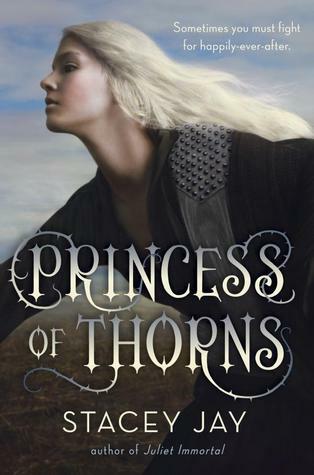 Princess of Thorns is a not-so-classic retelling of the Sleeping Beauty story. The main character is actually the daughter of the cursed princess, who awoke from a kiss. Her name is Aurora, like the Disney movie’s princess and her mother’s name is Rose. In the French version of the tale, Sleeping Beauty’s daughter is named Aurore. I believe that her mother’s is the shortened form of Briar Rose, like German version of her tale by the Brother’s Grimm. If you are familiar with the Grimm and Perrault versions of the tale, not only the Disney one, then you will notice many similarities. In a few versions of the tale, there is an evil step-mother or mother-in-law who attempts to eat the leading lady’s children. The author makes use of these characters and plots in her novel. She chooses to include the ill-fated mother, brother, and sister, as well as the villainous step-mother. Although that familial tie is not explicitly stated, the King was the children’s father and he married the ogre. Thus, she would be their step-mother. And you thought you had a dysfunctional family? In true fairytale fashion, there are ogres, witches, fairies, and ruffians. Not all are portrayed as you would expect. The ogres have evolved or perhaps devolved depending on who you ask. In the early years, the Ogres were monstrous creatures that devoured souls whole. They did not control themselves but feasted on the entire soul leaving nothing behind. As time went on, they were forced to change and limit how much they took. After a time, the ogres began to become smaller and take on much more human-like appearances. Their food source never changed and they prided themselves upon each soul they took, marking their bare skulls. The Fae seem human, although they possess extra-human traits and magic. One may not think of fairies and immediately imagine a human-like creature with great dexterity, skill in battle, and a lack of guilt -but the Fair Folk are shown this way in the novel. A fairy can bestow a gift upon a human child, like beauty, courage, eloquence, obedience, or strength. But each blessing comes with a curse, as the magic always finds a way to turn the gift into a burden. There are untold consequences to the blessings that cannot be avoided. As such, the fairies stopped giving their gifts to human children. As with most fairy tales, there is an element of romance. The love story blossoms under unusual circumstances and not without its share of problems. The two characters get to know each other throughout the journey, but there are many secrets left untold. As they are discovered, the relationship is altered for good or bad. And in the end, a choice must be made. Most importantly, the novel isn’t entirely predictable (although the budding romance was expected). Generally, you expect good to triumph over evil in most modern retellings of the story – unlike their Grimm counterparts. The plot’s climax was frankly a little anti-climactic, but enjoyable non-the-less. I think the author showed an average amount of character development, although I usually think more would be incredibly beneficial. Certain aspects of the world were explained, but not vividly enough. The “show-don’t-tell” method could have been employed here to create a richer, more immersive world. Overall, I was pleased with the author’s lexicon, grammar, and spelling – which happens much less often than should reasonably be expected. I would certainly read another novel by this author as I love stories based on fairytales. If you read Alex Flinn, I would highly recommend this novel to you just keep in mind it is slightly darker. Readers of fantasy, romance, and the like will enjoy this book and should give it a chance. It seems to target the female demographic, but males should enjoy it as well.